I warned y’all of the holiday explosion that was to come and this is just the beginning! And it is so gorgeous that I don’t want to take it off!! I bought China Glaze “Twinkle Lights” about 2 months ago and purposely waited to wear it until Christmas time, and I am kicking myself for waiting so long. I am positively IN LOVE with this polish! It is in my mind the perfect holiday color and is a dream to apply. Plus, there isn’t an overly gritty feeling to this polish which just sent me over the moon. I never have an issue with the texture of any polish (with the few exceptions) so I normally never blog about the texture of a polish, but this glitter is so smooth I felt like it deserved a slight mention. This polish consists of micro glitter with gold, green and red glitters. The gold is the primary color but has really good equal amounts of green and red. Honestly, this is holidays subdued and in my mind totally blew China Glaze’s “Party Hearty”, the chunky green and red holiday glitter from last year that everyone raved about, completely out of the water. It isn’t as in your face with holiday colors and is more subdued but definitely has the same feeling of the season. I can’t say enough good things! Its festive but not tacky, easy to apply, opaque in 2 coats, dries fast and has a good texture on the nail. Plus this is day 3 and the glitter hasn’t chipped at all, which is more than I can say for the red counter part of the manicure. 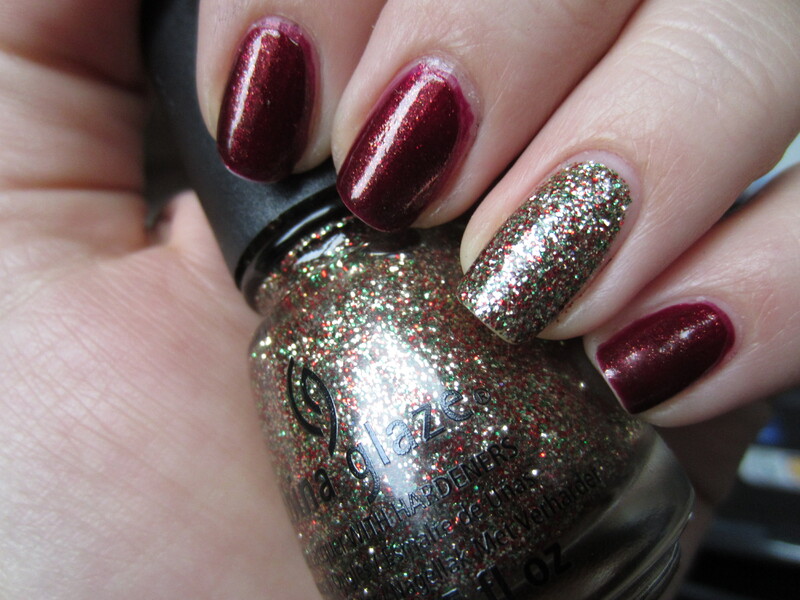 Sephora by OPI “What’s Your Point-Setta” is a deep burgundy color with a ton of gold shimmer. This polish came out with Sephora by OPI’s holiday last year and it took me a minute to actually buy this one. I debated it about it for a while last year before I got a nice little push from my best friend. I took it home and my mother went crazy! A little background on my mom would make this more meaningful … My mom works construction, drives a pick up truck, and doesn’t own any makeup besides blue eyeliner which is a struggle to get her to wear. Needless to say, she isn’t a girly type girl and sometimes it amazes me that I fell in love with nail polish and makeup when I was never exposed to it as a kid. I think my mom can count on her hands how many times she’s painted her nails in her life. When I brought this polish home she fell in love and immediately painted her nails, before I could ever use it on myself. For the entire month of November and December last year it was on her nails and she would touch it up almost every day. I have since never seen her wear nail polish so this color holds a special place in my heart, especially around the holidays. So this color is my go-to holiday red because of the memories and because its a deep red with gold shimmer, that’s such a no-brainer holiday color. Then to pair it with an amazing festive glitter. I’m in love with the holiday explosion on my nails! And stay tuned for more holiday manicures, because I’m about to get campier with the reds and greens! That China Glaze polish is gorgeous! !